Dr. Decker resided in Calgary and brought death to those who created life. He usually wore a misshapen mask while stabbing his victims to death. The mask was made of an undetermined material (some speculate it was human skin, others say it was leather or burlap). 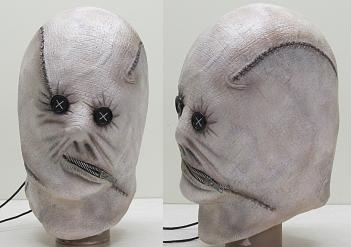 The mask’s eyes are buttons and the mouth is a zipper. The mask is fastened at the back by a lace that weaves its way in and out of a series of tiny metal rings. Decker’s mask also features several scars, which indicate that the mask was stitched together. 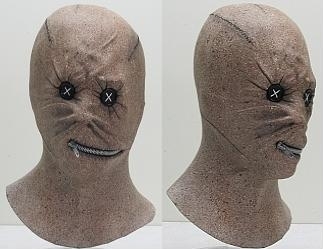 Much like Michael Myers’ pale mask, Dr. Decker’s mask is expressionless. It is designed to instill fear without looking too threatening. 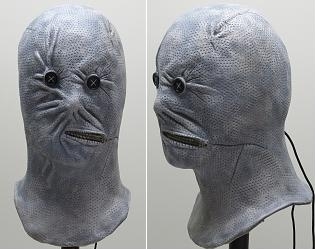 It’s one of those masks that has to be worn to cause an eerie vibe and a what the hell? reaction. In Nightbreed, a cop handles Decker’s unworn mask and he isn’t spooked by it. While Michael’s mask is easily identifiable as a human face, Decker’s isn’t. It seems as if it were thrown together, paying little attention to facial symmetry. In viewing the masks of recent villains such as Dr. Crane/Scarecrow from Batman Begins and The Man from The Collector, one sees definite influence from Decker’s mask. My friend mtlongy and I have collected some Dr. Decker replica masks. Here they are with their relevant information (I actually need your help with one of them). A mask that is large enough to give a bit of a baggy look to it when worn. Great emotionless look to it. This replica has a unique texture to it – it feels like a cross between latex and hardened leather. Should easily fit larger heads. This copy comes courtesy of fellow member mtlongy. A smooth mask with a stellar paintjob. Size is around 24”. I don’t know who made this mask. I’ve compared it to the ones listed here and to photo references of other Decker masks – but it doesn’t look like them. The latex is quite thin. 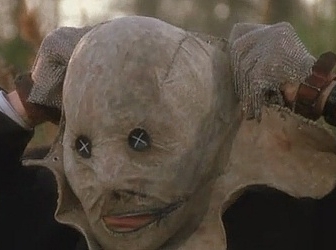 Loved the Decker mask ever since I first saw Nightbreed in 90′!Awesome character and awesome movie.Cronenberg was perfect for the part.He’s just a creepy dude in general. That’s my copy next to the title up there and it will never leave my collection! thank you sikwitit for lending your excellent photo! I agree that Cronenberg was made for that part. I like the scene when he reassures Boone that everything is all right, then yells, “He’s got a gun! !” and the cops open fire on him. Thanks for the info, Mike; it’s much appreciated. So was that mask done by Justin or Jake? (either way, there’s another KX Decker mask i have to get). 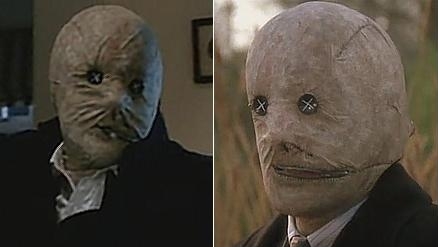 If they decide to remake Nightbreed, which is not unlikely since they are remaking every single movie known to man, I personally think Bradley Cooper should play Decker. Kind of looks and sounds like him, plus I think he has the ability to play a calm, yet intense and dementing character.